@IBOutlet weak var artworkImageView: UIImageView! @IBOutlet weak var podcastTitleLabel: UILabel! @IBOutlet weak var podcastAuthorLabel: UILabel! Note that each outlet is weak because it will be owned by it's superview. Also note that each of the outlets are implicitly unwrapped optionals. This is because the cell instance is created first, then the outlets are connected from the Storyboard (or XIB). 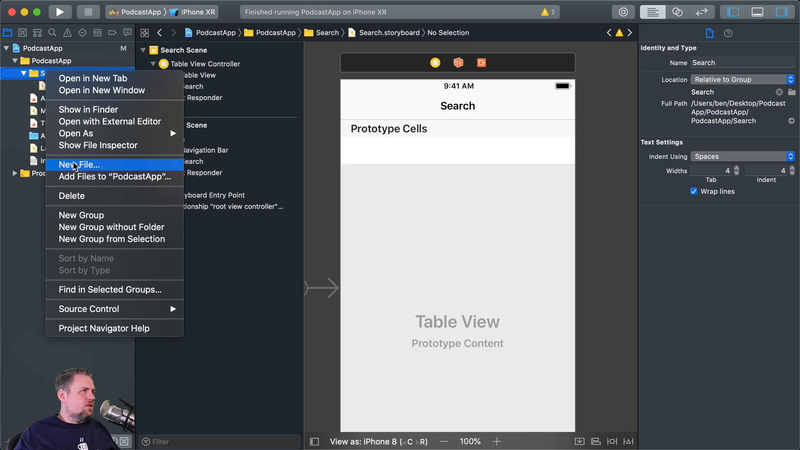 UITableViewDataSource provides a mechanism for reusing cells. It does this by first registering the cell types that are in the storyboard (or cells registered manually in code). Each of these has a reuseIdentifier, which is a string that uniquely describes the type of cell you want to register (or reuse). Most of the time you'll have a single type of cell, and the common convention is to use the class name to identify it. We can codify this convention with Swift Protocols. Any type that conforms to this protocol will inherit this behavior (though importantly they can override it if the type needs to deviate from the convention). We're using String(describing: self) here which is a way to get the name of this type (the method is static after all, so self refers to the type itself, not an instance of the type). Since the default behavior is suitable, we don't have to write any code, we're simply adding the protocol. Now that our cells have this protocol, we can extend UITableView to take advantage of it. This method is similar to the built-in dequeue method, but this one is strongly typed (using the generic T) and gets its reuseIdentifier from the protocol. Back in our view controller, our cellForRowAtIndexPath method gets a lot cleaner! Note that we must specify the type of cell we're attempting to return. This is how the compiler is able to figure out what T is in the generic method call.